Polytec introduces a new range of subtle wood grain embossed matt finished laminates to their product portfolio. WOODMATT joins Polytec’s core palette of laminates and melamines in a choice of 12 unique prints and colours, and three distinct families. Made in Australia, the new prefinished boards combine the best of natural timber with the most advanced technology, and are being seen as a game changer for the surfaces industry and designers. Exceptional print quality, improved super matt surface finish and tweaking of natural timbers with more contemporary tones are some of the standout features of the new WOODMATT collection, setting a new benchmark for standard laminates and melamines. Designed to match the perception of authentic timber veneer in look, feel and warmth, WOODMATT is available in laminates and boards for use on any horizontal or vertical surface from joinery and walls to benchtops and more. Polytec’s WOODMATT offers the complete package to meet the diverse requirements of surface applications across all market sectors, such as warm timber tones, durability, easy maintenance, scratch resistance, consistent and fade-free appearance, and value for money. The enhanced laminate range has been designed to meet evolving Australian interior design trends, especially the use of more refined finishes and multiple timbers within spaces. Even the sheet sizes for all products in the Polytec laminate and melamine family are aligned to the Australian marketplace’s preference for working with 300mm modules. This product consistency allows mixing and matching of the 12 WOODMATT variations within the range and across the entire laminate collection. Each of the nine oaks, two walnuts and a beech in the WOODMATT range features varying degrees of grain refinement and light or dark contrasts, allowing for different design aesthetics to be created. 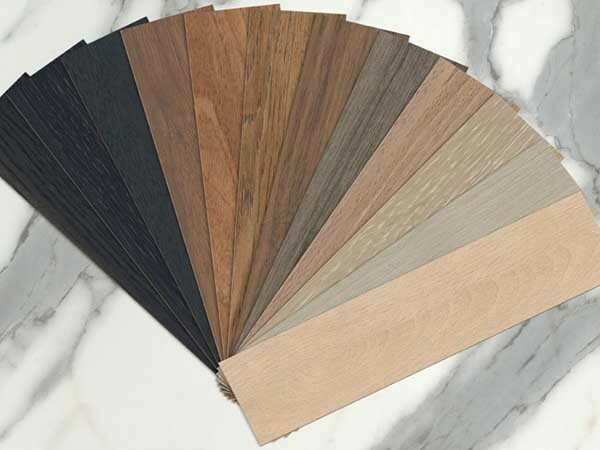 Made by an Australian company for the Australian market, WOODMATT offers a premium range of laminates at standard pricing, making Polytec the go-to brand for core laminates. WOODMATT’s oak family offers a choice of cool to warm tones with more subdued planking patterns and a softer blend of colours. The collection includes Nordic Oak’s Scandinavian tones; Coastal Oak’s white underbase; Estella Oak’s sultry darker hues; Empire Oak’s dark grey staining; Bottega Oak’s beige green undertone; Angora Oak’s wool-like mix of grey and natural tones; and Tasmanian Oak’s slight pink undertones and realistic oak. The two new walnuts include the more traditional Florentine Walnut featuring rich chocolate and monochromatic light to dark browns, and Nataio Walnut with a more yellow base, overlaid with contemporary grey tones. The sole beech in the latest WOODMATT range is Casentino Beech, inspired by an Italian plantation and featuring softer tones and a more refined grain with sensitive grey undertones, in comparison with previous beeches. To make online specification as convenient and realistic as possible, Polytec’s website allows large format colour swatches to be printed that depict pattern structure with a click-to-order option for getting large sample sizes delivered. WOODMATT products have also been named to help specifiers visualise the colour or the structure of the product. Polytec will follow up their initial launch of WOODMATT in residential sheet sizes in laminate and board (LPM 2400x1200x16mm and HPL 3600x1200mm benchtop and laminate) in December 2016 with a commercial WOODMATT offer during 2017.